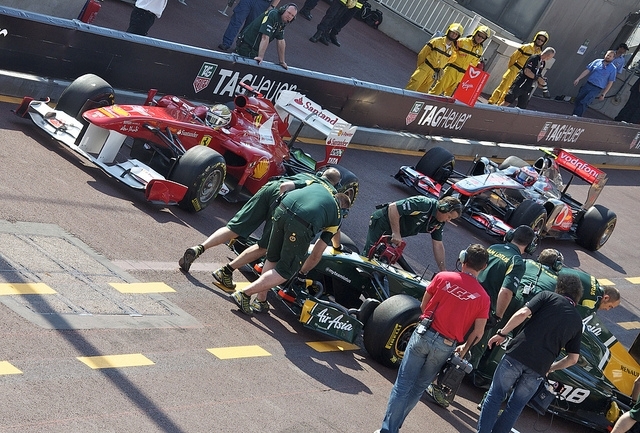 To say Sebastian Vettel won the Monaco Grand Prix, while true, barely does the event justice. This was no Monaco procession, nor was it a stroll for Vettel of the sort we've seen more than once this season. It was a tight, exciting battle that ebbed and flowed. At no point was it clear who the winner would be. And for all of the various incidents up and down the field, as far as first place was concerned Monaco was a game for three players - Vettel, Alonso and Button. All performed magnificently. Vettel headed Jenson Button off the line from pole, and Fernando Alonso managed to shuffle ahead of Webber to claim third. From that point on no one else saw them. And on two separate occasions they put close to a lap on the fourth placed car only for a safety car to negate much of the gap. They finished in the order of Vettel first, Alonso second and Button third, but there were many adventures along the way. In the opening laps Vettel disappeared off like a scalded cat, building a gap of around four seconds in the blinking of an eye, which Button then clawed back a little. But then a botched Red Bull stop for Vettel, seemingly down to a breakdown in communication, put Button ahead of Vettel after the first round of stops. Button, still on option tyres, then appeared to have the race in the palm of his hand. He put often upwards of a second a lap on the chasing Vettel, who, mistakenly having had primes put on in the confusion of his stop, struggled to stay in touch. However, this tyre mistake ended up giving Vettel the win. Button made his second stop curiously early, on lap 34, still short of half distance. Perhaps he was wary of a big chain of cars to lap lurking ahead, but it still seemed an odd call. This dropped him behind Seb (Alonso had pitted at a safety car period shortly afterwards to put Button second), and while it was a tyre strategy that was theoretically faster it gave scant regard to the fact that Jenson would now face a Vettel-shaped roadblock at some stage, that he'd need to clear if he wanted the win. Indeed, Seb had a trick up his sleeve, electing to attempt a mammoth 60-lap stint on his prime tyres to the end of the race. Brave stuff - and apparently it was all Seb's idea. Button, unable to reasonably hope that his options would last to the end, soon pitted. This left us with a race fascinatingly poised, Vettel leading Alonso leading Button, all with their planned stops done and each with fresher tyres than the guy ahead. In the closing laps they were running together, Alonso in particular developing designs to pass Seb. But just when a grandstand finish looked certain, a red flag was thrown for a concertina-type accident involving Petrov and others (fortunately, as with Sergio Perez yesterday, his injuries were minor). There was a final six-lap shoot out after the red flag, but cars were permitted to change tyres during the stoppage, and the top three finished in the same order with no more drama among them. The other big story of the race was Lewis Hamilton, but more for what he did after the race than during it. Starting in ninth, he put in a rather erratic drive, wherein he ended at least one drivers' race (Maldonado - who'd put in a great effort that would have otherwise been rewarded with sixth place at least in all likelihood) and possibly ended another (Felipe Massa's). In both cases, the contretemps was mainly Lewis's doing, going for desperate lunges that were always going to end in tears. But afterwards, faced with a BBC microphone, he showed no outward sense of responsibility, instead absurdly attributing blame to the other guy in each case and aiming extreme verbal barbs at the stewards for having the temerity to give him a drive through penalty for the Massa incident (based on other incidents, here and previously, he was never not going to get one). He got a retrospective time penalty for the Maldonado stunt (which didn't cost him his sixth place), but I suspect Lewis soon will be getting a call from the FIA to visit Place de la Concorde for his comments. This is the latest of various verbal barbs from Lewis in recent weeks and months. He's said that his loyalty towards McLaren 'has its limits', he's claimed to be the only guy of the grid capable of challenging Vettel in an inferior car, and yesterday had a lot to say in public about what he viewed as substandard strategy by McLaren in qualifying. Today's effort only represents a continuation. Something, somewhere is rattling his cage it seems. But it was Seb's day. Yes, he was lucky, both in qualifying and the race, but he was also fast and consistent all weekend, made no mistakes (including under heavy pressure from two of the best overtakers in the business) and was always there to take advantage of his good fortune. And Alonso and Button put in equally sublime efforts. Hopefully Lewis's diatribe won't detract from the real story, and real stars, of Monaco 2011.